Beckworth is claiming that AD growth has been steady despite fiscal contraction which it has. In fact the standard deviation of the quarterly growth rate in nominal GDP (NGDP) since 2010Q1 is by far the lowest for any 13 quarter period on data going back to 1947. Many Fed watchers have been stunned by the amazing steadiness of the NGDP numbers despite all the various fiscal policy shifts (or cliffs) and this raises serious doubts as to the existence of a liquidity trap. I’ll admit, it’s not at all clear to me how the serious doubts follow from the amazing steadiness when GDP growth is stuck in the mud, but it’s that steadiness that I want to focus on – eventually. Meanwhile, Graph 1 shows the YoY percentage growth in GDP over my life time, seasonally adjusted quarterly data. As you can see, GDP growth has certainly been steady over the last three years, albeit at a remarkably low level. Market monetarists argue that since monetary policy has been inept and fiscal policy has not been expansionary, this steady growth casts serious doubts on the efficacy of fiscal policy. Why can’t one simply turn this around and say that since fiscal policy has been inept and monetary policy has not been expansionary, this steady growth casts serious doubts on the efficacy of monetary policy? Either way it makes very little sense. And you’ll note that supporters of fiscal policy never make this kind of claim. But let’s get back to GDP growth. Remember the simplicity of Graph 1, because in Graph 2, I’m going to make it very busy. The purple line is a 13 quarter moving average and the yellow line is a 13 year moving average. Both have been in decline since the early to middle 80’s. 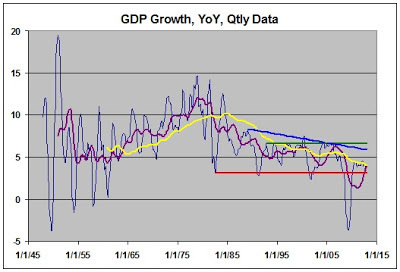 The red line is the growth level at the bottom of the 1982 trough – effectively a lower limit to GDP growth until the 2009 collapse. The green line is the growth level of the 1993 recovery – effectively an upper limit to GDP growth that we may never again experience. The blue line connects peaks since 1989. The downward trajectory is both unmistakable and disturbing. This is the legacy of Reaganomics, deregulation, globalization, a bloated rent-collecting finance sector, and growing inequality. Average GDP growth for the entire data set since 1947 is 6.67%, nearly identical to the peak green line value of 6.58%. Why is this relevant? For a decade starting in 1971 GDP growth was never below 6.58 percent. Since 1993, it’s only been above it for a brief blip in 2000. For much of the 70’s GDP growth was above 10%. For the last 20 years GDP growth has been below the 6.67% average since 1947, and for the last 6 years, it’s been below 5%. The low standard deviation of GDP growth is simply an artifact of low GDP growth numbers. That will be the subject of part 2. Interesting how similar your chart 1 of this post and your chart 2 of the prior post look (over all shape). My comment on this post: The statement of how “stable” growth has been in the face of monetary and fiscal policy just seems to be another way of saying “free market” baby. No need to do anything. Of course the other side is that if either have no effect then might as well go pedal to the metal all the way. But, I know the objections that would be raised there: inflation and debt and confidence oh my! Sadly, this thought that growth has been stable is the same thinking that allows us to have recessions. Everything is fine until it’s not. That is, as long as the number is positive regardless of the declining value of the positive number we do nothing because it’s positive. It’s the half empty/half full limited thinking when the physics question is: which way is volume of the glass moving. Of course, to even conceptualize one’s world in this way requires one to accept that the economy is a human creation and thus reflects human design and desire. The glass is half full or empty because that is where we stopped pouring the liquid. A good part of this is demographics. 1) How steady has nominal GDP (NGDP) growth been? Well the standard deviation of quarterly changes in NGDP at an annual rate was 5.67 during 1947Q2 through 1984Q4. During 1985Q1 through 2005Q4 it fell to 2.09. NGDP growth averaged 7.94% and 5.71%respectively during these periods to the standard deviation as a ratio of average growth is 0.714 and 0.366 respectively. I’ll skip over the early Bernanke years as we all know how that went (it’s the nightmare that keeps on giving). How steady has NGDP growth been since 2010Q1? The standard deviation is 1.22 and the average growth rate is 3.91, so the ratio is 0.311. Anyway you measure it NGDP growth has been real smooth since 2010Q1, the only problem is it has failed to close the output gap. So no this is not just an artifact of low growth numbers. Volatility has dropped like a stone. End of story. 2) You’re mistating the Market Monetarist argument. I personally don’t like the MM nametag and don’t call myself MM but I’m extremely sympathetic to their views on monetary policy. In this particular context what MM is saying is that monetary policy is never impotent (bluntly put, the liquidity trap is a myth). Thus monetary policy always has the ability to offset fiscal policy. (Within reason obviously. The impact of fiscal policy is of course more immediate, and that’s what Bernanke meant when he coined the term “fiscal cliff”.) Since monetary policy always can move last and more frequently, in a game theoretic sense it has the final say. Given this what is the point of doing fiscal stimulus? Monetary policy can generate whatever economic recovery we want.And if the FOMC is satisfied with the snail’s pace of the recovery any fiscal stimulus that the Congress and President may enact will simply be offset.That’s the economic reality, so get over it. So if you want a more vigorous recovery the place to start is at the FOMC not the House of Representatives, and the last time I checked the House had people like Boehner, Canter, Ryan and Ron Paul in charge, who are not only opposed to fiscal stimulus but are violently opposed to the Fed doing anything more to spur economic recovery as well. [Incidentally I always thought it was curious Democrats have worked themselves up into a frenzy over a fiscal stimulus that ain’t never going to happen when monetary policy trumps fiscal policy and President (who’s Democratic) always has the ability to pack the Board of Governors (BOG) of the Fed with people who could pursue a more expansionary monetary policy. And yet Obama left several seats vacant on the BOG until about a year ago and Democrats never complained one bit. NGDP is a nominal quantity (that’s what the “N” stands for). To the degree that any of those things have real effects they affect real quantities, not nominal ones. Over the medium and long term the only thing that affects nominal quanitities is monetary policy. The only one of these pillars that has an effect on nominal quantities over the medium or long term is the last one. That is the cause of lower NGDP growth: tight monetary policy. The same goes for bloated finance, globalization and inequality. They can impact real quantities but they cannot change NGDP. Over the medium and long term only the FOMC can do that. P.S. On the flip side, over the long term monetary policy cannot fix low real GDP (RGDP). For that you need real supply side policies (not necessarily the kind that Reagan proposed). Real steady and moderate…right out the bottom of the glass until empty. Of course, this does prove the Fed can effect growth rates such that inflation offsets achieved fiscal policy? Saw it every time labor was about to make a play for more of the income, out came Greenspan with his rise in interest. Still, seem like you and Jazz are talking past each other. And there are political realities. Recess appointments can only be when there is a recess. The repub congress has made sure there are none. Not that I’m excusing the O. I think what you are complaining about here is rather odd. The O is doing just as one would expect of a Chicago Schooled person. That we’re not seeing a stimulus package (which suggest short term need which is just so short sighted) I think has more to do with conservative economic thinking having been accepted by the so called liberal party than the repubs stopping it. But who’s listening to the populous anyway? That’s so populous. So, in the end, I see your message, MM all the way. But, Jazz is correct, the moderation is happening at an ever declining level of growth. 1) I’m using the data from the FRED graph above and having Excel do the calculations. I get St Dev values far below those you cite. I don’t understand thse differences. I’ll be diving into Std Dev tomorrow. This is the MM mantra. Got any evidence? Regarding your parenthetic aside, Dems are the new Republicans. I’m not a fan, and won’t defend it. Look, I’m always willing to have somebody prove me wrong. But the operative word is “prove.” You’ve made a naked assertion and done nothing to back it up but make more assertions. And you talk about religion. 1) You’re obviously using annual data instead of quarterly data. Try it with quarterly rate of change at an annual rate and you’ll get the same numbers as mine. Examine any example of a supposed “liquidity trap” you want (e.g. Great Depression in U.S., U.K., Sweden and the contrast between the U.S. and the eurozone today) and monetary policy has always been effective.In particular there’s lots of research that’s been published on monetary policy during the Great Depression. 3) You need to understand the difference between nominal and real quantities. NGDP is measured in dollars.There’s absolutely nothing to prove. 1) Nope. Quarterly data. I link to the FRED page in the graph title. 2) I’m not arguing that monetary policy isn’t effective. I’m arguing that fiscal policy is also effective. 3) Nominal in dollars, Real adjusted for inflation. What does that have to do with anything I’ve said? How does it validate your “nonsense on stilts” jab? Everything I mentioned affects the ability of ordinary people to consume. Are you denying that consumption is significant, and that monetary policy is the ONLY thing that affects GDP? If so, then Dan is right and we are talking past each other. 1) OK, now I see what you’re doing. You’re calculating the standard deviations of the year on year changes of NGDP. I’m talking about the quarter on quarter changes of NGDP at an annual rate (which is what I was referring to in my comment on your previous post). 2) No MMer has ever denied that fiscal policy has effects. The issue is whether there is a liquidity trap. And if there isn’t one then monetary policy can always offset fiscal policy (given my earlier qualifications). 3) In the long run NGDP has zero effect on RGDP and so has no impact on the ability of ordinary people to consume. In the short run changes in NGDP can greatly affect RGDP and so do have an important impact on the ability of ordinary people to consume. I really don’t see how GDP of any type can have an effect on “ordinary people” to consume being that GDP of any type is a measurement in part of said consumption. As to no liquidity trap, what is the evidence in the economy that it has done anything other than allow the banks to keep their assets booked at the pre-crash values thus assuring the banks are not underwater? Why would you suggest that anyone here is suggesting N or R GDP has any relationship such that one effects the other when both are just 2 different measurements of the same activity? 1) Macroeconomic stabilization policy (i.e. monetary and fiscal policy) has the ability to keep GDP near maximum employment. In an economy at less than maximum employment it is usually ordinary people that fare the worst since their consumption is more likely to be dependent on employment. 2) It might be useful to compare the US with another large currency area that is also up against the zero lower bound in policy interest rates and has done no QE at all. That would be the eurozone. Since August 2008 the Fed has increased its monetary base by 245% and the ECB by 48%. According to Econ 102 there are primarily two ways that policymakers can regulate aggregate demand (AD): fiscal and monetary policy. And by definition aggregate demand is nominal GDP (NGDP). Two ways of measuring fiscal policy stance that Krugman referred to recently in his blog are general government expenditures as a percent of potential GDP (“American Austerity, An Update”), and the cyclically adjusted primary balance (“Self-destructive Europe”). The April 2013 IMF World Economic Outlook (WEO) projects that between 2009 and 2013 general government expenditures as a percent of potential GDP will fall from 41.6% to 37.8% in the US (a decrease by 9.2%) and will fall from 49.6% to 48.0% in the eurozone (a decrease by 3.3%). The IMF WEO projects that from 2009 to 2013 that NGDP will increase by 16.2% in the US and by 7.6% in the eurozone. The IMF also projects that from 2009 to 2013 that real GDP (RGDP) will increase by 8.5% in the US and by 2.5% in the eurozone. So AD increased twice as much in the currency area that actually did QE, and contracted its fiscal policy stance nearly three times as much by this measure. The April 2013 IMF Fiscal Monitor projects that between 2010 and 2013 the cyclically adjusted primary budget balance as a percent of potential GDP will increase by 4.0% in the US and by 3.8% in the eurozone. The IMF WEO projects that from 2010 to 2013 that NGDP will increase by 12.0% in the US and by 4.6% in the eurozone. The IMF also projects that from 2010 to 2013 that RGDP will increase by 6.0% in the US and by 0.5% in the eurozone. So again, AD increased by nearly three times as much in the currency area that actually did QE, and contracted its fiscal policy stance more by this measure. 3) As I’ve said earlier, policymakers have the ability to regulate aggregate demand (AD) through monetary and fiscal policy, and by definition AD is nominal GDP (NGDP). Policymakers do not have the ability to directly regulate real GDP (RGDP) as it is subject to supply side factors largely outside of the control of monetary and fiscal policy. However RGDP, as it is adjusted for the aggregate price level, is a better measure of aggregate material well being. Yeah, I get it that “ordinary people” get left out in a less than maximum employment condition. Problem is, “ordinary” is the category that captures the vast majority of people in this nation. And, being that there are conversations suggesting we’re in a new period in which “maximum” is redefined as more people being unemployed kind of makes the whole our growth better than EU not so comforting. Of course, many here have known before it happened that the EU approach was a looser. If RGDP is NGDP modified by inflation and the Fed can target inflation, then there is the ability to effect either one. Unfortunately for either fiscal policy or monetary policy theory, it is only this last period since 1980 that economics has experienced a declining share of income such that the 1% went from 8.7% to 24% of the income. Before that, like post depression the shift was going the other way. That kind of makes monetary policy and fiscal policy theories wanting now. Because as you noted, the “ordinary people” just aren’t seeing or feeling or experiencing the theorized results. Though I guess it’s not so much theorized results as we have seen growth, just not anything that includes the greatest majority. But, in an economy that has seen it’s make up change such that finance (money making from money) becomes about 1/3 of the activity and the primary policy applied is directed at that 1/3, well of course you’re going to see growth. It’s not like manufacturing is holding up. If the EU has seen the same shift in the make up of their economy and they did not pump money into it, then of course you won’t see as great a growth rate. if not actually caused by stupidity, it is a cause of effective stupidity. That particular Steve Keen model has two potential outcomes. A low interest rate leads to a debt induced total collapse of the economy. A high interest rate leads to an infinite debt to output ratio equilibrium. Needless to say neither of these things has come to pass. Did you miss the GFC? Has the economy completely collapsed? Because that’s exactly what Steve Keen’s model predicts, and if so I must have missed it. On the credibility scale I rank Steve Keen only slightly ahead of Tyler Durden.